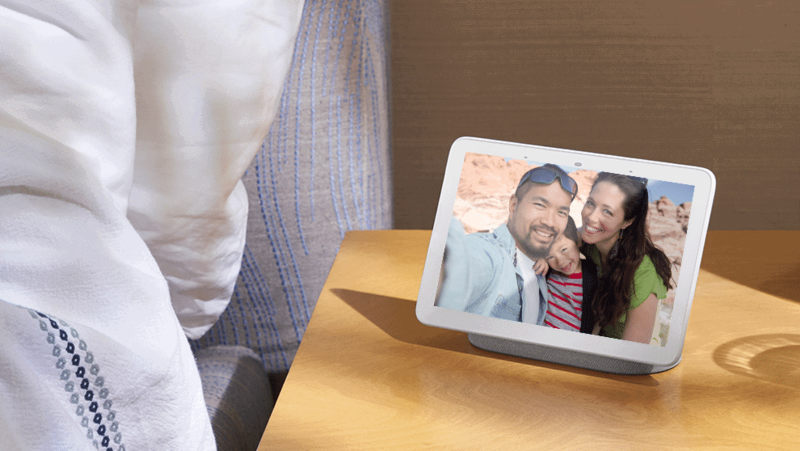 Google Home Hub is actually very small in size, however, that doesn’t really seem to matter because it is surprisingly useful in very many ways. From taking you through complex recipes to organizing your smart home to locating for you a decent place to dine if you can’t really cook. The Google Assistant, which is super great, is what actually makes this small device as mighty as it is. In fact, there’s a really blurry line between where the digital of the Google Assistant does most of the heavy-lifting and where the Google Home Hub’s hardware actually shines. 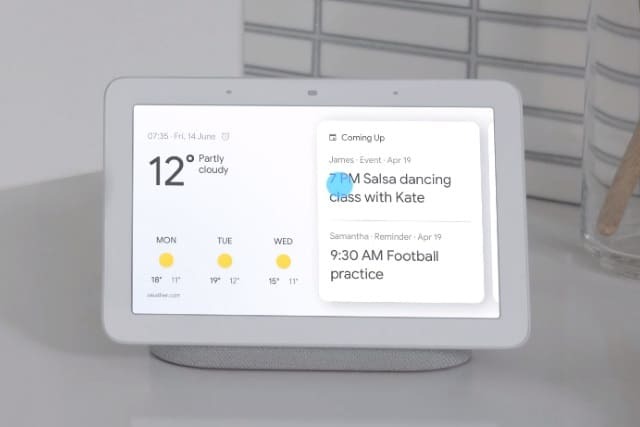 Anyway, the Hub is basically a smart display that has the ability to combine the functionality of smart, voice-controlled speakers like the Google Home original with the touchscreen capability that allows you to watch videos, look at pictures and so on. If you are a Google fan and you’re interested in controlling your smart home using Google then this is the ideal product for you. However, if you just think a screen with a smart speaker is simply just a brilliant idea like we do, then this is what you need as well. The intuitive voice commands and seamless touchscreen controls will even help those members in your household that are tech-phobic get used to it easily. Coming in at a little over 4.5-inches in height, the Hub is considerably small. Accompanied by a 7-inch portrait style display screen connected to a stand that’s an oval fabric. Unlike the Amazon Echo Show, the hulking beast that’s its main competition, the Home Hub from Google doesn’t take up that much room at all. In fact, you can place it almost anywhere in the room without it taking up too much space. That’s actually what makes it an easy fit in most parts you choose to place it in. However, unlike most other smart displays, the Hub doesn’t have a camera at all. Depending on how you see things, this can either be a bad or a good thing. The only buttons you’ll find on the Home Hub’s outside casing is the mic on/off and volume up/down button. When placed beside it closest competitors such as the Lenovo Smart Display and the Amazon Echo Show, the Hub looks like a mere smartphone amongst tablets. While this tiny size brings with it a lot more versatility, you’ll find that many smart displays are originally designed to be used primarily in the kitchen. It comes with a free YouTube Premium, however, that’s a little unfortunate because the screen size is a bit too small for extended periods of watching. Who needs pictures in frames anymore, right? When you think about, it’s kind of like a digital photo frame. By any chance, if you also use Google Photos you have the ability to connect your photo albums to your device. Doing this during set up will allow you to have your choice photographs rotating throughout the day. This is a great feature that for most people that end up using this device will love. We love it too here at the Gadget Gang. The Ambient EQ feature automatically adjusts screen brightness which is a super cool feature as well. 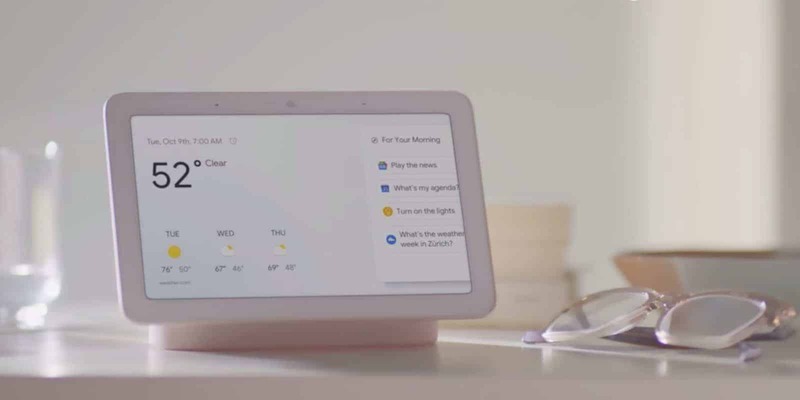 Google Home Hub allows you the ability to issue a large variety of voice commands. Plugging it in and setting it up is done using the Google Home application through Wi-Fi connectivity. Once you’ve set it up properly you can then proceed to ask the Home Hub any question or query you’d ask the Google Home original thanks to the fantastic Google Assistant. The Google Assistant makes very good use of its touchscreen capabilities with helpful visuals that are provided after every question you ask. Ask about the weather forecast and you’ll be provided with forecast illustrations for the entire week. Scroll through your display screen options and tap any one of them if you want more information. In that area, it works almost exactly as a tablet or phablet would. If you can’t get there Google will even show you how you can go about it on the map as well as send you directions through your phone. If you have an Android smartphone then this process will work automatically, but it works on Apple iPhones as well. So, iOS device users don’t fret too much just yet. However, you’ll have to install the Google Assistant app before you can use it. The Home Hub can place in phone calls for you as well. This is because the Google Assistant has voice-recognition capability and can recognize the user’s voice. Once it has registered your voice, it can find contacts from your phone’s contact list and dial them. Yeah, feels very Jetsons-like, no? it will even show the recipient that it’s you that’s calling. The Home Hub, instead of your typical camera, has its new AI feature known as the Ambient EQ as well as an ambient light sensor. This new AI feature gauges the room’s light and adjusts both the picture’s warmth and brightness accordingly. It produces some really fantastic results. This new feature is largely why even though it has a really small screen the videos still happen to look so good. However, it’s undoubtedly still at its best when you have just pictures on the screen display. The pictures come out looking like the way they would if you had professionally printed them out then put them in a frame. I mean they look that good. Move the Home Hub or turn off the lights in the room it’s in and the light sensor quickly adapts the picture. This is certainly and outstanding smart home product from Google. Well worth every penny. Yes, it has come into what’s currently a highly competitive field, but it definitely holds its own. The Ambient EQ feature and Google Assistant are almost unbeatable tech as of now. If you want to take your smart home tech to a whole new level then not many can do it better than Google Home Hub. Go on, try it out then come back and tell us if you agree. The Google Home Hub is an incredible piece of kit, priced exceptionally well, with some fantastic features the Google Home Hub is a must buy for any Smart Home enthusiasts. Featuring some incredible voice commands, and a suitable size for your kitchen side. For more information read our full review.